In March 2011, the stories of parents attempting to opt out of state high stakes standardized tests began to spread. Parents in Colorado, Illinois, Pennsylvania, and South Carolina, made the news, with the Pennsylvania story covered by CNN and Fox. These news stories sparked a wave of renewed interest by frustrated parents across the nation. While there are a number of groups providing support to parents in many states, online and on Facebook, Parents and Kids Against Standardized Testing caught my attention. Parents from around the nation began posting questions, sharing experiences, and collected in the Discussion tab. Some from public education joined posting information as they had available. This month I looked back at those stories and several things are apparent. Notably, individual schools, school districts, state-level staff, all the way to the U.S. Department of Education provide conflicting information. A familiar refrain at the local level is that opting out is not possible since high stakes standardized tests are mandated under No Child Left Behind. Parents want the facts and the fact is there is nothing in the federal legislation that requires students to take the test or remove parental right to not permit their child be tested. The federal legislation, however, requires that schools give the tests. Failure to give the tests in sufficient quantity and failure to meet legislated improvement levels may bring sanctions on the schools. Individual states have established rules and regulations, some specifically address opting out and others do not mention it. Some deny opting out under all conditions, including medical doctor recommendations for students with complicated health conditions. Other states will consider unique situations and hardships, such as a medical condition, or if testing is against a religious belief, but nothing else. Then, there are states that do provide parents an option to Opt Out requiring nothing more than a simple letter to the principal. Opting out by keeping the child at home would seem a simple solution; however, the consequences for parent and child must be considered. Since testing takes up to 10 days in some locations, absences of that length can exceed attendance rules and a child may be required to repeat the entire year. A parent in Texas reports that in their school district there are punishments. "..if we take them out without a doctor's note for more than 3 days, we will be fined $500 per child, taken to court, and a truancy officer will visit us." Parents with students in charter schools report that opting out of tests may lead to the school denying re-enrolling the next school year. Classrooms converted to test prep centers. Plans for the increased quantity of federally mandated high stakes standardized testing under Race to the Top initiatives. Misinformation and confusion over parent rights to opt out of high stakes standardized testing. Parents are not saying they are uninterested in their student’s progress or opposed to accountability measures that reflect progress in their communities and across the nation. They are not saying that sub-group comparison is not important. What they are saying loud and clear is that they reject the way standardized testing has taken over the school environment and have a parental right to say no. All eyes on South Carolina parents who are challenging the mandated high stakes standardized testing. Parent Gretchen Herrera intends to take her case to the South Carolina capital on October 3, 2011. Her story is found here. A resource for information about your state and a place to share your personal experiences and knowledge is Opt Out of Standardized Tests. K-12 Testing $2.6 billion business: Who pays? Who benefits? Andrew C. Porter has been an education reform advocate, supporting common core standards and assessments; however, he has changed his mind and expressed his current assessment in a recent Education Week article. "In short, I hoped that new national curriculum standards would be better than the state standards they replaced, and that new student assessments would be better, too." Using a "recognized content analysis tool," Porter participated in an analysis of the common core standards comparing them to existing math and English language arts standards in over 20 states. The resulting findings were "unexpected and troubling." "The common-core standards do not represent a meaningful improvement over existing state standards." When comparing these standards to those countries who are described as beating U.S. students and international exams, he finds other countries focus more on basic skills and less on higher order thinking skills. He wonders if the standards fail to achieve the "right" balance. "But what I know so far about the work of the two multistate consortia developing the assessments isn’t promising. It sounds as if the new assessments may ignore state-of-the-art research and technological advances, settling for tests that are much like the ones we already have. Meanwhile, innovative work on assessments that’s been going on in the states has ground to a halt while everyone waits to see what the consortia come up with." Porter concludes the common core et al may end up "much ado about nothing." He is, however, one more in a mounting number of voices questioning the effort. From a taxpayer's point-of-view - who pays, who benefits? Grumpy Educators posted the investigation into Rupert Murdoch's entry into the education sector and the deal under investigation with the NY Department of Education. Follow up on this story is reported in the Huffington Post today. The NY Department of Education has cancelled the $21 million dollar deal with News Corp, using money NY received as part of its Race to the Top grant to obtain services related to the creation of a centralized student database for personal information. New York "State Controller Thomas DiNapoli "quietly rejected" the contract, citing News Corporation's "incomplete record" for qualifications, the Daily News reports." Reposting the following clip from last month that is fact-based and easy to understand the Rupert Murdoch/Wireless/NY State deal. lack of funding and it has affected student learning. discover any benefits of having a high school exit exam. Performers and Successful Reformers in Education, OECD Publishing. The Florida Today newspaper covered the School Board of Brevard's decision to examine parent consent when it comes to access to student information. The Board decided to obtain input from parent-advisory groups before making changes to who can request student directory information in accordance with federal laws. According to the Florida Today reports that "the district does not release certain information -- such as photos or email addresses, or a student's grade level or school name -- that federal guidelines allow." "Typically, military, colleges and research institutions request the information. In addition, it is often released to graduation vendors, such as those handling class rings or senior photos. Non-educational uses of directory information must be approved by the superintendent, District Spokeswoman Christine Davis said." Information on the Family Educational Rights and Privacy Act can be found here. “Relief is needed immediately before more schools suffer for another school year under inappropriate labels and ineffective interventions,” Torlakson wrote in a letter to Duncan. The letter warns that many schools with rising student achievement will be mislabeled as failing under the “one-size-fits-all” approach required under NCLB. In addition, the letter notes that NCLB restrictions on how districts can use funding will further burden schools already hit hard by budget cuts. Torlakson noted in the letter that he is working with the state Legislature to put in place the next generation of accountability systems to evaluate schools more appropriately and effectively, and urged the Administration to support state-determined accountability systems. In addition, Torlakson’s letter states that the current federal waiver proposal “presents problems for California” by asking states to commit to new policies that are beyond the scope of NCLB. “The appropriate forum for consideration of any new federal mandates is through the Congressional reauthorization process, which by its nature requires greater transparency and broader democratic debate,” Torlakson said in the letter. When No Child Left Behind (NCLB) Act of 2001 was first signed into law in 2001, it marked an important change in the way schools, districts, and states were held accountable for the performance of each and every student. However, the NCLB accountability model has not kept pace with the next generation of school and teacher accountability systems that many states, including California, are working hard to develop. Now four years overdue for Congressional reauthorization, flexibility from the flawed NCLB policy is urgent and necessary. Relief is needed immediately before more schools suffer for another school year under inappropriate labels and ineffective interventions. One of the widely recognized problems with NCLB is the “one-size-fits-all” approach to labeling schools that fail Adequate Yearly Progress (AYP), regardless of the reasons for the failure or whether the school fell short by a little or by a lot. We project that a significant number of California’s schools, approximately 4,600, or nearly 80 percent of our schools that receive federal Title I funds, will be in improvement status for the 2011–12 school year. Even more are expected to fail AYP over the next few years as targets rise, and as such, the federally-imposed labels cease to provide any meaningful information to stakeholders who deserve a more comprehensive understanding of a school’s performance. NCLB’s mandatory identification also places restrictions on how districts can use funding to meet the unique needs of its schools. Such funding restrictions impose huge burdens on the schools of California, which have already experienced $18 billion in cuts in state and local funding over the last four years and face looming triggered cuts for the upcoming year. The economic crisis has hit California harder than nearly any other state. We do not have the luxury of dedicating scarce resources to meeting the rigid requirements of an outdated and ineffective federal law. Additionally, NCLB’s flawed accountability system places undue stress on the districts’ and the state’s capacity to meet the needs of increasing numbers of identified schools. School districts, as well as the California Department of Education (CDE), are forced to dilute resources and attention to the point of being potentially ineffective in those schools that most urgently need district and state support. Capacity is stretched to the limit in trying to meet the needs of increasing numbers of identified schools. Because of these shortcomings of the NCLB accountability system, I believe flexibility is appropriate, warranted, and urgently needed. California schools require immediate relief from the escalating sanctions imposed on schools that fail to make AYP. Thus, for the 2011–12 school year, I propose that California be permitted to freeze sanctions and mandatory identification required under NCLB Section 1116 at the 2010–11 level. Schools that have not made AYP would not be subject to initial identification nor to escalating sanctions, but rather, would remain in their current status of school improvement, corrective action, or restructuring, giving the district and state additional time to provide positive supports. This approach will give California schools additional time to implement current interventions without forcing them into a new, short-term model while the state moves forward in developing our next generation accountability system. In the absence of Elementary and Secondary Education Act (ESEA) reauthorization beyond this year, I urge you to support individual state-determined accountability initiatives already in place in many areas of the country. In California, we have a strong history of focusing on local school accountability, including through our Public School Accountability Act. I am now working with our state Legislature on the next generation of school accountability systems in order to evaluate schools more appropriately and effectively. Moreover, we are moving toward a more robust teacher and principal evaluation system that considers numerous researched-based elements, including student outcomes, multiple observations, and the California Standards for the Teaching Profession. California is ready and willing to hold our schools and systems accountable to the high standards set by our state, and I hope to work with the Administration in partnership toward this goal. Finally, the conditional nature of the waivers presents problems for California. I understand that waivers may be granted only if a state commits to certain policy priorities of the Administration, including adopting college- and career-ready standards, imposing a differentiated accountability system, and adopting a teacher/ principal evaluation system that incorporates student test results. These policy priorities would mark dramatic deviations from the existing policies required under NCLB. States would be asked to make commitments beyond NCLB with no commensurate funding to provide the state capacity to implement such requirements. The appropriate forum for consideration of any new legal mandates is through the reauthorization process involving transparency and Congressional democratic debate. If the Administration is unable to support robust state-determined accountability systems prior to ESEA reauthorization, I urge you to ensure that states are not held hostage to new and under-funded policy requirements in order to receive necessary relief from the unrelenting march toward mislabeling hard-working and effective schools for improvement, corrective action, and restructuring. I appreciate your leadership in recognizing states’ need for immediate flexibility from an outdated and ineffective federal law. I hear daily from superintendents and educational leaders across the state about the urgent need for swift action on this issue. I trust you will take this proposal into consideration before finalizing requirements for waivers. My staff, California State Board of Education staff, and I, welcome the opportunity to meet with you and your staff to begin a dialogue concerning flexibility options available to California, and would be pleased to host your team to discuss California’s vision for a relevant and effective accountability system. If you have any questions regarding this subject, please do not hesitate to contact me, or have your staff contact Cathy McBride, Federal Policy Liaison, Office of the State Superintendent of Public Instruction, by phone at 916-319-0650. I appreciate your support and assistance, as we work to find the best ways to benefit our students. Recorded Wednesday, August 24, John Merrow interviews Secretary of Education Arne Duncan at the first Twitter Town Hall. Merrow asks Duncan a variety of questions, beginning with the planned NCLB waivers. South Carolina appears to have ignored this fact with regard to two cases where parents requested their children not participate in standardized testing. Gretchen Herrera's son has a complicated medical condition, which is exacerbated by testing regimes. His medical team recommended he not be tested as it puts his health at risk. The request was denied, Mrs. Herrera allowed testing, and after the first day of testing, his health was negatively impacted. If a parent had neglected the health and well-being of their child, they'd find themselves in court with the government stepping in to protect the child. In this case, the government is endangering the child and ignoring the parent. Grumpy Educators reported her situation here. She has taken her request all the way to Washington D.C., and her battle continues this year. Sharon Johnson's son has a complicated medical condition, and was treated in "an outpatient day treatment to stabilize children with severe emotional and/or behavioral problems. Among other criteria, admitted children must have demonstrated behavior serious enough to jeopardize the safety of others." Upon completion of treatment, he enrolled in public school and slated for standardized testing. In spite of a written medical recommendation that "he was mentally unable to be tested", South Carolina insists if a child can attend school, the child can be tested. Ms. Johnson believes it is discriminatory to "require mentally unable students to take the exam when physically unable students are exempt, and she's filed a federal Office of Civil Rights complaint to that end." Her case is in process. Read more here. "It's about measuring the school and district performance," Emerson said. "That's the way the standards are applied." The child is not the mere creature of the state; those who nurture him and direct his destiny have the right and the high duty, to recognize and prepare him for additional obligations. Is the State endangering the health and well-being of these students by ignoring medical recommendations? "Our current education reform strategies are aligned with this exact goal and I am confident that through the continued hard work of our educators and school leaders we will see significant progress in this area in the years ahead," he said in a statement." Sound familiar? Parents, community members, and taxpayers have given up on unresponsive, unaccountable, and unrealistic policymakers and legislators, and have formed a group - OPT OUT OF THE STATE TEST: A NATIONAL MOVEMENT in an effort to reign in failed and entrenched standardized testing initiatives that have converted schools into test prep centers and not environments of learning. Will this group be successful in its mission? Check it out on Facebook. The Department of Education announced today that Secretary Arne Duncan will participate in the first-ever #AskArne Twitter Town Hall on August 24, 2011 at 1:30 p.m. EDT. Veteran education journalist John Merrow will moderate the town hall that will also be broadcast live on ED’s ustream channel. Beginning today, Twitter users can submit questions to the Secretary using the hashtag #AskArne. 1) How much is the total cost down to the local level to implement the new generation of assessments? 2) Where is the money going to come from to fund this initiative? 3) Will sub-group comparisons still be required? 4) Why is it necessary to implement excessive standardized testing? 5) What recommendations do you have to confront the high turnover of teachers at charter schools? 6) What is the rationale for a database from birth to first year of college? 7) Given the rash of security breaches and hacking into secure sites, why should any parent or community have confidence FERPA Privacy protections will be maintained? 8) Why should parents be excluded from any access to their student's information? Then, I might Twitter: "I am a NUT. No Unnecessary Testing." A recent Stanford University study reveals that charter school teachers have a higher turnover rate than traditional public school teachers. Elementary teacher turnover is 33% higher than turnover at public schools and close to four times higher at the secondary level. The report indicates that younger unmarried teachers without children who work at charter schools are "better able to handle the intense teaching demands more than those with family responsibilities." Do charter schools pay attention to teacher burn-out? Steven Brill's recent article in the Wall Street Journal, Super Teachers Alone Can't Save Our Schools does not look at working conditions deeply enough although he exposes the views of two charter "super teachers." "I work from 7:30 to 5:30 in the building and then go home and work some more," the teacher told me. "I get disrespectful pushback from parents all the time when I try to give their kids consequences. I get feedback from my [supervisors], who demand that I change five or six things by the next day. I think we are doing a great job, so I keep at it. But there is no way I can do this beyond another year or two." "Sure, we have turnover, but our teachers make good money," and "they can advance quickly." "I have [assistant principals] who are 28 years old and making $100,000 or $120,000, who get six weeks' vacation," Ms. Moskowitz said. "How bad a career path is that?" How bad a career path is it? Great question. Successful businesses across the nation recognize the importance of working conditions on motivation, productivity, and retention. Brill reported that Success Charter Network lost one of those super-teacher turned assistant principals because the demands created an "unsustainable" life, both on her health and her marriage. At 28, she walked away to save herself. ".....if you tore up every union contract in the country, that would just give you the freedom to try…. Then you would have to train and motivate not 70,000 or 80,000 teachers"—the number now teaching in charter schools—"but three million," the approximate number of teachers in American public elementary and secondary schools. As Mr. Levin explained to me, "You can't do this by depending only on the kinds of exceptional people we have around here who pour themselves into this every hour of every day." "Every hour of the day????" Somehow Levin and Moskowitz miss the important and widespread best practices from the business world that acknowledge it takes more than money and 6-weeks vacation to retain talented employees. These charter school leaders express no vision on a teaching environment that retains talent and seem almost cavalier at the level of turnover. There are cost implications when investing in training and losing the talent. So, why are charter schools that have higher turnover rates than public schools and operate like sweat shops considered exemplars for replication at "scale?" The nation cannot afford 3 million teachers trained and burning out in two years. Taxpayers should not be called upon to fund such a model. Where's the accountability to students, parents, community members, and taxpayers? UPDATE: The 28 year old assistant principal who left the charter school position found a position in a traditional school, which she found to be more sustainable. Found this detail on Alexander Russo's blog. He says he will be posting an interview he had with Mr. Brill in the next issue of Scholastic Administrator. A phone call from a parent alerted North Carolina Department of Public Instruction officials that private data on school students was posted online. "Data housed on a N.C. State University computer server that contained private information for about 1,800 schoolchildren from Richmond and Wilson counties was inadvertently made available online, university officials said Tuesday. The data, gathered from 2003 to 2006 as part of a research study on classroom practices, included names, Social Security numbers and dates of birth. The three affected elementary schools are the now-closed Ashley Chapel in Richmond County and Gardners and Wells in Wilson County." Read more on this breach of data here. Although the source of the error is not described, the news report alludes to a computer "glitch" of some type. How seriously should this breach be taken? Could student data be hacked, repackaged, sold, and revealed? Recent reports reveal an Anonymous group of overseas hackers have threatened attacks on U.S. law enforcement computer systems. Of the 70 attacks claimed by the group, only Arkansas and Louisiana attacks have been verified. Officials say that no sensitive data was accessed. Last month the U.S. National Security Council released a report in which it named cyber crime as a major threat to national security, and costing the U.S. $1 billion annually in losses. With Race to the Top dollars, states have been developing State Longitudinal Data Systems using federal parameters and guidance. However, the Los Angeles Times reports that California's Governor Brown recently decided to reverse that State's decision in development of the SLDS saying districts had the data they needed. "As part of what you described as a "cradle to career agenda," the Department of Education is aggressively moving to expand data system that collect information on our nation's students. I am concerned by recent reports that indicate the Department's hasty pursuit of this goal could compromise student privacy rights." Kline goes on to say: "The Department's efforts to shepherd states toward the creation of a de facto national student database raises serious legal and prudential questions. Congress has never authorized the Department of Education to facilitate the creation of a national student database." Read Rep. Kline's full letter here. Teacher performance pay is described as the rationale for this massive data collection initiative. Does a performance pay structure through data collection outweigh the costs, risks, and privacy considerations? For facts and details on SLDS, go to Truth in American Education. According to Education Week, no mention of education policy came up in the first Republican candidate debate; however, it came up 5 minutes before the end in last night's debate with two candidates responding and no time for the rest. Candidate Jon Huntsman said he would not "continue to enforce NCLB" and prefers more school choice and technology in the schools. "The federal government should get out of the business of trying to micromanage the education of our children." Texas Governor Rick Perry who has announced his candidacy for President, but was not in the debate has declared he is opposed to Obama's K-12 initiatives. We will have to wait and see what federal education policies, if any, he favors. What do we know? In two debates, the national concern over the effects of federal education initiatives was ignored, consistent with the education reform narrative supported by mainstream media. Silence is the political establishment status quo. Among the growing number of groups, Parents Across America issued the following press release indicating their rejection of Secretary of Education Duncan's plan to offer states conditional waivers from NCLB regulations. The national organization Parents Across America opposes the proposal by U.S. Education Secretary Arne Duncan to offer “waivers” to states, exempting them from provisions of the law known as No Child Left Behind if they adopt education policies favored by Duncan. While Parents Across America (PAA) agrees that No Child Left Behind is an unrealistic, rigid and punitive law, the waivers that Duncan has now proposed are likely to be equally bad, if not worse. The Department of Education could force more states to adopt the Common Core Curriculum thus continuing to ignore the fact that it is illegal for the federal government to impose a national curriculum. The proposal is also likely to expand the destructive agenda of over-testing, school closings, and privatization, despite the fact that these policies have no scientific evidence to support them and are causing tremendous distress in communities across the nation. "Administration officials said they will grant waivers to states that adopt standards designed to prepare high school graduates for college and careers, use a “flexible and targeted” accountability system for educators based on student growth and make “robust use of data,” among other things". "Montana Schools Superintendent Denise Juneau said she welcomed the waiver proposal, as long as it offers relief from the 2014 deadline. She said her state isn't afraid of high standards and education reform but needs enough time to reach those standards and freedom to institute change in a way that works for Montana. "I don't mind the goals and we're certainly not afraid of accountability. They can set the bar wherever they want. They just have to let us have the flexibility to get there," Juneau said. "We can definitely meet any bar they throw at us." The details on the conditional waivers will be announced in September. These conditional requirements are familiar, included in the Race to the Top competitive grants and provided implementation dollars. With state and local budgets already slashed deeply, how will states that did not get RT3 funds implement new mandates? So far there are two major problems: legality and funding. Parents, community members, non-educators, and taxpayers across the nation have concerns that go ignored or trivialized by State and federal entities driving so-called education reform and by mainstream media. Kudos to Florida's The Gradebook for the interview with Rita Solnet, co-founder of Parents Across America. Grumpy Educators supports Parents Across America, a grassroots movement, which calls into question expensive federal and state initiatives including those that link expanded standardized testing starting in preschool and a national student longitudinal database, with an urgent need to reform the nation's schools. 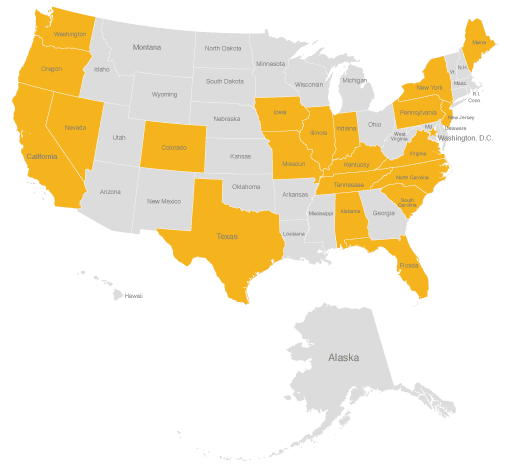 Parents Across America has chapters in 26 states. Read the interview here. Since some folk are "confused" over what the public is saying to federal mandates, here's a simple presentation. "It’s time to reduce the federal role in education. How will the story end?" NCLB legislation requires the nations schools to achieve 100% proficiency in assessments or be sanctioned (which means funding cuts). The US Congress agrees that the bar they legislated is unreasonable, but have so far made no adjustments. Under this criteria, Secretary of Education Arne Duncan warned that 82% of the nation's schools would be designated as failing; however, the Secretary has the power to give "waivers." Legislators have been critical of Duncan's waiver procedures, which require adherence to Race to the Top objectives that have not yet been legislated. Education Week reporters reviewed data and determined that 89% of Florida schools are out of compliance with NCLB mandate to reach 100% proficiency through standardized testing data. Will Florida also request a waiver? Of note, Scathing Purple Musings reviews effects of unfunded mandates on local districts here and here. The only way mandates will be funded is through increase in revenues at the local level. The mechanism is through property taxes. From Washington D.C. to Tallahassee, fiscal irresponsibility continues. Watching Flagler School Board Colleen Conklin and possible lawsuit against the State over school funding. Read her rationale here. Rita Solnet is a co-founder of Parents Across America and a parent and businesswoman from Florida. She spoke at the SOS March on Washington D.D. rally in a speech titled: "Stop wasting our tax dollars on failed reforms." "I’ve witnessed how this obsessive focus on standardized tests converted schools to test prep factories. Schools no longer have time for Music, Arts, Literature, PE, Social Studies, Languages, Civics. So don’t talk to me about Innovation. No, you can’t fool me. I don’t want to burst your bubble test, but this is not good education! I’ve watched how we now teach our children how to guess at bubble tests– as if the answer to all life’s problems will be placed in front of them to choose. I see how everything rides on these scores–teachers salaries, their jobs, whether the school remains open–it all falls on the shoulders of that one child taking that one test on that one day. Is that what you mean by Game Changer? You can’t fool me. We are abandoning entire segments of our nation for the sake of collecting useless data — that’s right –useless. The children nor the teacher never see the results. Right answers, wrong answers, where they need to improve–who knows? They never see it. Does that make sense to any of you here? I’m here today to add my voice to yours to appeal to common sense in education. I’m here today to say stop wasting my tax dollars on failed reforms. NCLB never worked–it put us in this mess. I’m asking this Administration and Capitol Hill to listen with a Capital L. Listen to those in the trenches — Listen to informed parents — Listen to your constituents. I’m not alone. There are many parents here today. We’re here today to give the Dept of Education a Robo Call of our own! Right? I’m the co founder of Parents Across America and we are here today in full force. Seattle, Spokane, from San Francisco and Los Angeles—from Phoenix, Denver, Madison, Wisconsin and from Chicago, Portland, Oregon and New Orleans– from North Carolina, from Pennsylvania, from New Jersey, from New York and from Florida." Read her speech in its entirety here.